Well, I'm going in to this post forewarned by jarrett's comment in the last post. I'm very curious to hear why he was so dissapointed by Fatherland. I found it to be a well-written, thoroughly researched and entertaining historical (or faux future-historical) detective story. I'd go so far as to say that the ending actually had some emotional impact. It's 1964 in an alternate past where the Nazis win the Second World War. The hero is a detective in the Berlin police force (and by default a member of the SS). He is divorced, his son hates him and he's having ambivalent feelings about the Fuhrer. He is called on to investigate a body found in a river bank. An old guy, missing a foot, but in decent shape. Of course, the investigation becomes complex and dangerous, potentially revealing conspiracies at the highest level. I'm not going to go into any of the details of they mystery, because that's what keeps it interesting, but I found it very well done, fitting nicely into the history that we know and being compelling and disturbing in and of itself. I thought the book really captured that feeling of paranoia and self-censorship that a succesful nazi regime may well have put into place. Everybody has a file. If you're not in several party and social organizations, interest will be paid to you. Another interesting idea, a connection that I hadn't made, is the germans are constantly fighting a war against Russian and Communist partisans on the far eastern front. It's the "Total War" that Hitler postulated as a foundation of National Socialism. The partisans are called terrorists and terror attacks are a constant fear and fundamental part of the state security apparatus. This was written before 9/11 but sure sounds familiar. A fun read and well thought out. This is the second book taking place in Herbert's Con-Sentiency world and a sequel of sorts to Whipping Star. It's a universe where planets and races have been united by jumpdoors. The BuSab (Bureau of Sabotage) exists to ensure that governments never get so powerful that they can ruin society. Whipping Star dealt with the Calebans, the mysterious creatures who provide the jumpdoors for humans. This one has the same hero, Frank X. McKie, BuSab Agent Extraordinaire. This time, through the convoluted laws of the Gowatchin, these frog-like creatures, he is sent to investigate the hidden planet Dosadi. It is surrounded by a forcefield and unknown to the rest of the universe. Dosadi is inhabited by two species, the humans and the Gowatchin and none of them know that they are actually part of some experiment. They are the descendants of people who chose to escape whatever problems they had, have their memories erased and had themselves marooned on Dosadi. The planet is deliberately brutal and the descendants are in a constant state of war and survival, making them brutal and tough. McKie's job is to go to Dosadi, figure out what the point of the experiment was and whether the Gowatchin who are behind it should just destroy the planet rather than let the violent Dosadi people loose in the rest of the universe. It's a very interesting idea and the first few chapters of McKie on the planet are really cool, especially when he quickly realizes that all his experience, skills and equipment are useless against this supremely aggressive and adaptable society. Unfortunately, the book is pretty slow going, for several reasons. Though McKie's character is fleshed out much more than Whipping Star (and Herbert himself admits that that book was more of a history than a story in the preface to Dosadi), it still spends a lot of time on abstract, large-scale political theory. There is a lot of telling and not a lot of showing. I really wanted to see Dosadi, to understand how the planet worked, to interact with these tough people. But we got precious little of the streets and a lot of people in power strategizing in a complex game, whose ends and beginnings the reader has very little notion. By the end, the competition and conflicts are so complicated and abstract, and connected to races and worlds and histories with which I really had no connection, that I just didn't care. I felt only a minor elation at the protagonist's victory at the end and had no conceptual idea of why his victory was so important to the universe Herbert has created. There is a lot of political philosophy here, ideas about power and the relationship between the rulers and the ruled. Some of it is kind of interesting, but its not enough. It all left me feeling kind of tired and annoyed. Too bad, because it was part of a pretty good paperback care pacakge for my birthday. Well, I was wise to save Wizard for the end. What a fantastic book. I'd of course heard about the movie, but it was Jarrett who actually recommended the book. I'm quite surprised that I never came across it as a child, either read to me or read by myself. If you're not familiar with the story, it's about a widowed mouse who, in trying to find a way to help her sick son, discovers a community of very stange rats. I don't want to say anything more than that (like the méchant book flap which tells almost the whole story) about the plot, because the story itself is part of the pleasure of reading the book. This book does a tremendous job of capturing the cozy but limited world of the small animals living on the fringe of man and wilderness. With that foundation, it then creates an exquisite sense of wonder and excitement. Each new area outside Mrs. Frisby's (the mouse widow) experienced world is a little adventure in and of itself. It's tightly structured and the characters are strong and simple. It is also an innocent book, with a sense of reality. It believes in education and kindness, but is aware of the dangers of growth and science. I read this in a day. Strongly recommended. This is at least the third time I've read this book. The first was at some point in my teenage years, working my way through my parents collection of Michael Gilbert paperbacks. When I moved to New York, I would pick up any of his paperbacks I found, building up my own collection and reading them. This was my mid-20s. Sadly, I am motivated to re-read at least one of Gilbert's books now in honor of his passing. I will re-read them all again at some point, but they are still a bit fresh in my memory. 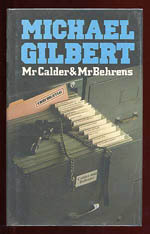 Mr. Calder and Mr. Behrens is a collection of short stories from Ellery Queen magazine recounting the exploits of two British counterinsurgency agents. There is another collection called Game Without Rules. Most of the stories take place in Britain in the late '60s and early '70s, though since both characters came up in the Second World War, there are many references to that period. Mr. Behrens looks like a nondescript college professor, is an expert linguist and strategist. Mr. Calder is a bit thicker, perhaps looking like a retired sergeant. He likes to mix it up, often chopping people "scientifically" in the throat or kidney. He is accompanied by a Persian Deerhound called Rasselas that he treats like a human. Both represent the best qualities of an ascendant Britain: well-educated, sensible, calm, stoic and honorable. A car breaking down is an opportunity for a good walk. They embody the great British notion (so lost on the Americans) of treating small things with great concern and treating large problems with aplomb (an important trait of the samurai, according to Hakagura). Gilbert spends a lot more time discussing the quality of the claret than the shooting of a spy through the heart. In one story, a wealthy colonel threatens to harm his MP and put a stop to a new road being built across his estate. Their boss tells them "I think we must take a hand. The loss of an occassional member of parliament may not be a matter of concern, but we don't want some innocent bulldozer driver destroyed." Ultimately, Gilbert is a moderate conservative, in the most classical sense. He believes in the importance of the state. He is also a moralist. There is always right and wrong in his books and when right meets wrong, it is right's duty to stop wrong in the most expedient and least disruptive way possible. Punches are not pulled in Gilbert's books, especially in the Mr. Calder and Mr. Behrens stories. Once discovered, spies are eliminated, generally shot, quickly and efficiently. However, his is ultimately a morality that wants peace and considers any aggression towards the innocent as just as much an outrage as treason. It is a morality I wish we had more of today, a sensible sense of duty and commitment to society, rather than the two poles of frightened aggression and weak self-indulgence we have in North America today. Read some Michael Gilbert as soon as possible. Got a nice old paperback copy of this as a birthday gift. I've read Dune and quite enjoyed it but didn't have much of an overall understanding of Frank Herbert. Whipping Star started out like a classic of 60s sci-fi (silver age? ), with a lone male character in a situation, using a language style very much from that period. However, quite quickly, it heads into a pretty bizarre metaphysical direction. It spends most of the time there. There is a plot about the end of all living creatures and it does come up with some narrative tension at the end, but really most of the book is about species trying to communicate with other species whose perspectives and existences are so different that they barely have a frame of reference to compare anything. I know I'm sounding really vague, but it's hard to explain Whipping Star because the plot is contingent on so many ideas. Very basically, the galaxy is full of civilizations that use these jump doors to hop from planet to planet. Nobody really understands how they work. The jump doors were introduced by the Calebans, creatures that live in these metal beachballs and are so mysterious that you can't even sense them properly. The Calebans are disappearing and the last one is discovered by the protagonist, who learns that an evil woman is flogging it (for her own bizarre reasons) and every time it's flogged, it slowly weakens. When it finally "dies" (though it calls it "discontinues" and it means something very different), anyone who has ever used a jump door will die, because of some previously unknown connection between the jump doors and the existence of the Caleban. Thus, the end of most of the sentient world. The protagonist McKie, an agent from the Bureau of Sabotage (a whole other thing to explain!) must try to communicate with this Caleban, who barely understands human existence and is only just learning to communicate, find out why it is being flogged and stop it before the world is over. So you can see there is a very high-level plot. But most of the book is McKie talking to the Caleban. It's such a different and theoretical world, and there is no real character development, that I found myself a bit removed from the process. This is not to be critical, because I think Herbert intended this book to be an exploration of these ideas and he didn't want to spend a lot of time and effort on those more lower narrative elements. It's a book for people who like interesting ideas of the way species could interact. There is also not tons of explanation of the world, giving you the sense that Herbert had thought a lot of it out already. It turns out that this is part of a mini series of books all taking place in the same universe. Two short stories and another longer novel called The Dosadi Experiment, which I also got with Whipping Star. I'm intrigued enough to see how the longer book develops this pretty wild setup. I picked this paperback up new for real cheap (99 cents) at a book sale. Despite its safe, pseudo-intellectual cover (some semi-abstract painting that had nothing to do with the book and was overly framed so you couldn't really look at it properly), the blurb about a story set in several time periods, including a post-apocalyptic future interested me, especially for a Canadian book. I only learned later that Maclennan is the author of Two Solitudes, considered the classic novel of relations between the french and english (which has long been on my list) and that this was one of his last books). Voices in Time is one of his last books and not very well known, though respected by those who've read it. The set-up seems arbitrary at first. The world has been destroyed and a fascist government called the Second Bureaucracy is running things. Their fascism is distant and indirect and seems to be relaxing as younger people take over. One of these young people is a historian who has uncovered a bunch of documents that tells the tale of the forgotten past (most records and memories had been destroyed and repressed by the First Bureaucracy). He contacts an old man who is connected to the documents. The book is basically the old man putting together the records, connecting them with his own memories and telling the story in the records. See? It's kind of a convoluted setup. But you start to get into it, because the stories the old guy tells are really engaging. The first one is about a young, hipster talk show host in Montreal in the late '70s and especially focusing on the time of the FLQ crisis. This guy is the older cousin of the old guy telling the story and he ends up, through his own selfishness and misguided politics and the power of his show, causing a casualty of the revolution. It all hinges around an interview he has with an german professor who was in Germany during the second world war. The bulk of the book is actually the German professor's story. He has to work for the Nazis in order to survive and to protect his loved ones, including his jewish fiancée he met in England. It's a gripping, brutal and sad story of a society turned to aggression and insanity. Just as a story, the professor's narrative is really satisfying. But it also reminded me how frightening (and how possible) the rise of Nazism was. The whole point of the book is to tie this in with the separatist crisis in Québec, to compare the similarities in youthful anger and uncontained social energy and how it can be used by forces beyond the understanding of the people in the street. He doesn't make a direct analogy between the Nazi movement and what happens in Quebec. He's not condemming anyone in particular, just pointing out warning signs. He takes it to an even higher level by putting it all in the context of a world totally destroyed as terrorism and the fascist response by governments reach a global level. Fairly prescient, no? The entire world is screaming for freedom and is sincere about it, but they don't understand what freedom is. The most violent screamers are really screaming for release from freedom's discipline, which means they are screaming for somebody to return them to slavery.